"Close your eyes and Nero will give you a big surprise!" 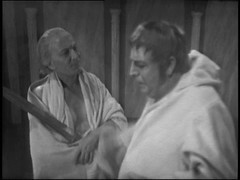 The Doctor is summoned by Tavius who tells him, still mistaking him for Maximus Pettulian, to put his plan into effect. The Doctor decides to figure out the conspiracy. 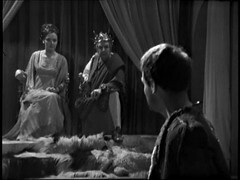 Nero talks with his wife Poppaea about Pettulian playing: Poppaea suggests a banquet in his honour. 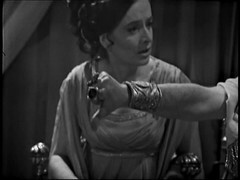 Nero is very taken with Poppaea's new British slave, Barbara, which doesn't impress Poppaea! 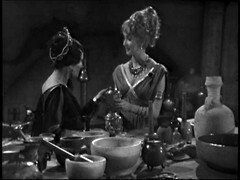 While clearing the food away she is "approached" by Nero who chases her round the palace, one thing on his mind, with Barbara narrowly missing meeting first Vicki and then the Doctor who are unaware she's there! Vicki stumbles into the chamber occupied by the official poisoner and chats to her about her role. 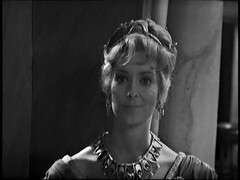 Barbara returns to Poppaea's chambers but Nero corners her. She hides and narrowly misses the Doctor who knocks on the door. Nero is caught by his wife who isn't impressed, while Nero claims Barbara is chasing him! 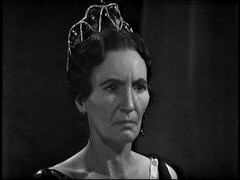 At the arena the female prisoner hears Ian's name and recognises it as the person Barbara was talking about during her stay. She tells Ian that Barbara was sold. 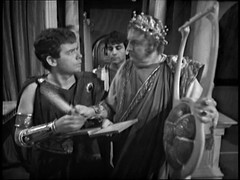 The bulk of the episode is more farcical comedy with characters narrowly missing each other and the Doctor, acknowledging as much on screen, re-enacting the Emperor's new clothes with the Lyre playing. We get poisoned cups being passed around missing their intended victim before killing the hapless Tigellinus and some form intrigue involving Tavius' plan for "Maximus Pettulian" but the end of the episode, with Ian being forced to fight his friend Delos and the Emperor ordering Delos to slay Ian, adds a darker tone to proceedings. 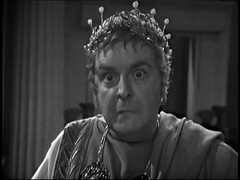 Nero, Derek Francis, is a fantastic comedy figure with distinct echoes of Frankie Howerds's characters in Up Pompei! 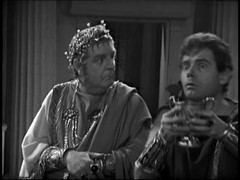 and it's stage predecessor A Funny Thing Happened on the Way to the Forum which also starred future Doctor Who Jon Pertwee. 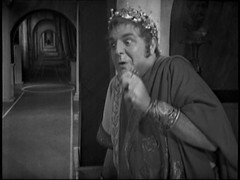 Nero's scenes with Tigellinus are amusing as is his pursuit of Barbara through the palace corridors. 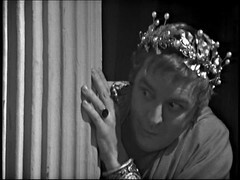 The Emperor Nero was born 15 December AD37 so that makes him just 26 during this story, which is set in July AD68 - we can date the next episode very accurately! He died, aged 30, in AD68 when he was deposed in a rebellion. 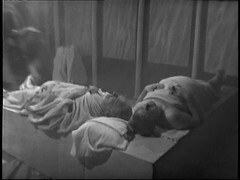 By contrast Derek Francis, who played him, was 42 when this episode was recorded! Nero isn't the only documented historical figure in this production though. Tigellinus was a little bit more than a cupbearer in real life: he was a prefect of the Praetorian Guard from 62AD until 68AD. He deserted Nero in AD68 for the new emperor Galba who had him killed 6 months later. Locusta was indeed a poisoner who was put to death by Nero's successor Galba in AD68. Poppaea Sabina was the Roman Empress as the second wife of the Emperor Nero. She had previously been married to the future Emperor Otho who succeeded Galba in AD69. She died in AD65, either kicked by Nero while pregnant or poisoned depending on which source you believe. Anne Tirard, who played Locusta returns as The Seeker in Ribos Operation episodes 3 & 4. Kay Patrick, Poppaea Sabina, returns as Flower in Savages episodes 1 & 2 before going on to direct & produce for Emmerdale, Holby City & Coronation Street.